We went and saw the new Hamlet out at American Player’s Theatre in honor of my cousin Keith graduating from his PhD program. It was a pretty good show–the fellow playing Hamlet reminded me of David Tennant’s Hamlet, to some extent, and the guy playing Polonius reminded me of Bill Murry’s turn at that role. Jim DeVita, who played Claudius, was quite good, and I was reminded of the first Hamlet I saw there, with Mr. DeVita in the title role then. Rosencrantz and Guildenstern were good and not portrayed as idiots, for once, which was very refreshing. There were some more interesting things about the casting this time–for example, Horatio, Fortinbras, and a few other parts were played by African American actors; I don’t recall seeing that previously. It does kind of raise some other questions about race in casting (like: Couldn’t you cast a Black Hamlet?). But it’s a step, right? Why is this funny? Because Sartre focused on the idea of choice. His thing about “authenticity” was that everyone should live the life that they want, so long as they do not negatively affect/exploit others, replacing ego with a “spontaneous selfness” he refers to as “ipsity.” As part of being in the world, we are free; choices represent a problem because they limit our freedom. But in order to really make a choice, you can’t just follow the path of least resistance–you need to actually make a choice. Since there’s no cream, he can’t really choose not to have cream, since he couldn’t choose the opposite (to have cream). (Quote from The Stanford Encyclopedia of Philosophy. Wikipedia also has a nice summary.) 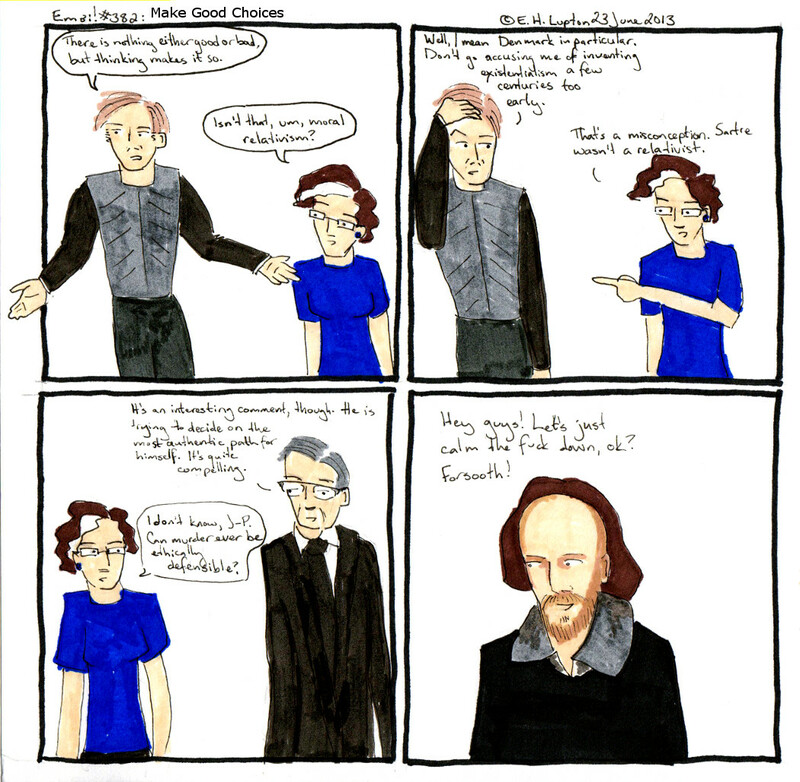 Anyway, Hamlet’s choice to either get revenge or spare his father is problematic in Sartre’s terms. This one is filed under PR2807.A8 L86 2013 for English literature–English renaissance (1500-1640)–The drama–Individual authors–Shakespeare, William–Separate works–Hamlet–Criticism. The process of choosing titles is a bit troublesome. I almost went with “Authenticity” (after a Harvey Danger song) but only my brother S. would have gotten it, since he and I are the only remaining Harvey Danger fans. As it is, perhaps he will appreciate this one. This one I’ll file under PN56.H83 L86 2013 for Literature (General)–Theory. Philosophy. Esthetics–Relation to and treatment of special elements, problems, and subjects–Other special–Topics A-Z–Humor. Also you should know that the Library of Congress has reserved the heading BF1311.S5 for Parapsychology–Spiritualism. Communication with discarnate spirits–Mediumship. Psychometry. Channeling–Spirit messages, inspirational records, etc.–Special, A-Z–Shakespeare, William. So. You know. That. Thy Shakespeare speaketh a strange tongue, and it is not Greek to me. “Forsooth” doesn’t appear in modern English, but Dictionary.com defines it as “in truth,”or “really.” It sounds as though it ought to mean “for Goodness’sake” or “come off it” or something similar, but apparently it doesn’t (or didn’t originally) mean that at all.